Q. Yesterday I got a message from Facebook that it had put a slide show together of my photos. Specifically, it took all the photos of my mother, including those in which she was in a hospital bed and set them to music. How can I prevent this? A. To keep you engaged with its offerings, the company automatically creates occasional videos from the photos you share, or gathers up all the posts you have made on a specific day in its “Memories” feature. While there is no direct way to stop these automatically generated videos at this time, you can have some control over the people who appear in your “Memories” and those spontaneous Facebook clips. To filter out someone you don’t wish to see in these nostalgia posts, point your browser to facebook.com/memories. When you land on the page, click the Preferences button. In the box that appears, click the Edit button next to People and enter the names you wish to filter out. You can also filter out events on certain dates to avoid being reminded of things like breakups, layoffs or deaths. 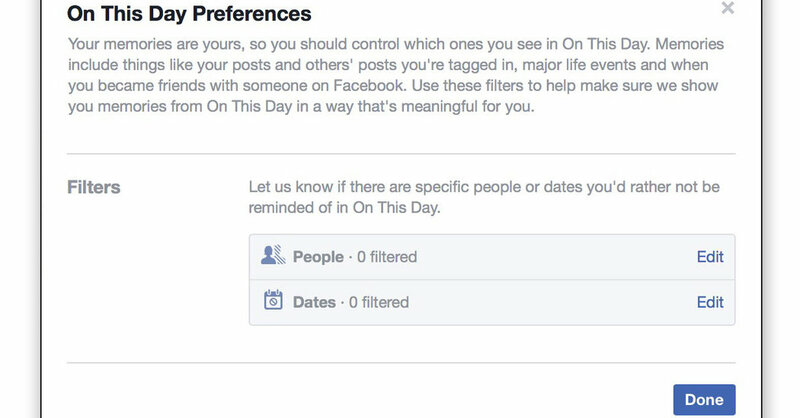 Facebook, which incorporates your privacy settings for content in videos, has also added its own filters in the attempt to exclude people you’ve unfriended, unfollowed, blocked, dumped (or been dumped by) — or people who have died and have Facebook pages that have been converted to memorialized accounts. But keep in mind: Facebook doesn’t cost money. Instead, sharing your personal information with the company and its advertisers is the price you pay to use it to keep in touch with friends and family. The company’s site has an explanation of how it use the data it collects from you. You should periodically check your account’s privacy settings to make sure you’re not sharing more than you think you are with Facebook — or the world.